Khloe Kardashian will reportedly give birth via a scheduled caesarean section on Friday (13.04.18). Khloe Kardashian will reportedly give birth on Friday (13.04.18). The 33-year-old star was said to have been experiencing contractions on Wednesday (11.04.18), a few weeks before her due date, but it's now been claimed she'll undergo a scheduled caesarean section later this week. 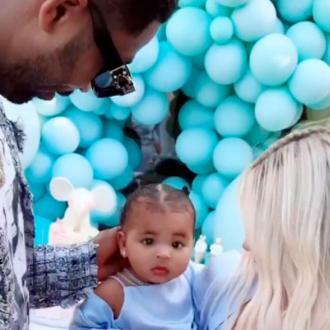 And in the wake of claims her boyfriend Tristan Thompson has been unfaithful, she no longer wants him by the side at the birth so her mother Kris Jenner and oldest sister Kourtney Kardashian are on their way to Cleveland, Ohio, to support her, while other sibling Kim Kardashian West will also be there when she has her baby. A source told X17online: ''Khloe is devastated and humiliated. She's trying to keep it together for the sake of the baby's health, but she's done with him. Although the 'Keeping Up With the Kardashians' star had planned to stay in Cleveland for some time because it offers her more privacy, she is now planning to fly back to Los Angeles ''immediately after'' leaving hospital. The source added: ''Immediately after [the birth], she plans on leaving Cleveland and never returning. ''Kris has been working on coordinating a private jet with a medical staff to get Khloe and the baby safely from Cleveland to LA. Tristan, 27, was seen getting close to a pretty brunette at rooftop bar PH-D Lounge in Manhattan over the weekend. The video clip appears to show the basketball player - who already has 16-month-old son Prince with ex-girlfriend Jordan Craig - speaking to the mystery woman before he seemingly leans in for a sneaky smooch. That's according to the woman who captured the footage, who said: ''I was there and he was on the table right next to us with a group of friends and some girl who he was obviously making out with all night.